alaTest has collected and analyzed 52 reviews of Blackmagic URSA Mini. The average rating for this product is 2.8/5, compared to an average rating of 4.0/5 for other Camcorders for all reviews. People really like the durability and image quality. The price and portability are also mentioned favorably, whereas some have doubts about the memory. We analyzed user and expert ratings, product age and more factors. Compared to other Camcorders the Blackmagic URSA Mini is awarded an overall alaScore™ of 87/100 = Very good quality. 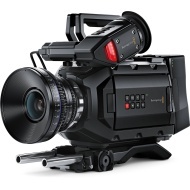 The URSA Mini and all its different versions form Blackmagic Design are some of the best 4K ultra HD pro video cameras in existence at this price. You cannot go wrong with this camera as your purchase choice. Got my URSA mini. Screen didn't work, issues with skippande framerate. Great image with good lighting. Bad image with no lighting.